When I invite my friends to join the TrulyRichClub, they invariably ask me what the TrulyRichClub is about and I’d tell them to Google the TrulyRichClub FAQ. Then I discovered the FAQ does not exist. So, here’s my modest attempt to explain what it is, and what it is not. No. This is not the place to get rich quick. There is no such thing as Get Rich Quick. Do not believe those schemes. The club teaches its members how to get rich slowly but surely, through the Stock Market, real estate, or business. Is this a Get Rich Quick Through the Stock Market scheme? No. TrulyRichClub teaches its members to be among the 15% who earn in the stock market by stock market INVESTING through SAM (Strategic Averaging Method ). TrulyRichClub discourages its members from joining the 85% who lose money by engaging in risky Get-Rich-Quick stock TRADING where traders try to time the stock market. Is this for lazy people to get rich? No. TrulyRichClub teaches its members to work hard today to build passive income streams in the future. Earning passive income means you can earn money even while on vacation. You plant seeds today to harvest tomorrow. Work hard now, and be (occasionally) lazy. Is this for people to obsess about getting rich? Is this for people to be TrulyRich? Yes! The TrulyRichClub teaches its members to be Truly Rich. Being Truly Rich means winning in all areas of your life: financially, professionally, emotionally, socially, physically and spiritually. Is this for people to be Financially Rich? Theology of Money. Many people are poor because they think money is evil. TrulyRichClub teaches its members that for good people, the purpose of money is to be able to enjoy life and share it with others. Is this for people to enjoy their life? Yes! The TrulyRichClub enjoins its members to earn money using their core gifts, how to profit from their passion, and do the things that they enjoy most in life. Is this for people to learn stress-free-stock investing? Is this for people to get FREE eBooks? No, TrulyRichClub.biz does not give away FREE eBooks, but it gives links to site with FREE eBooks. Yes! TrulyRichClub.com gives away free eBooks. What exactly is this club? It is a membership club of like-minded individuals who have decided to welcome the abundance of God’s universe. It gives us opportunities to meet mentors, and other members. It provides us periodic digital downloads of e-books, newsletters, audios and videos on various topics such as the abundance mentality and financial education. Is it true that Bo’s maid invests in the stock market? Yes and No and Yes. 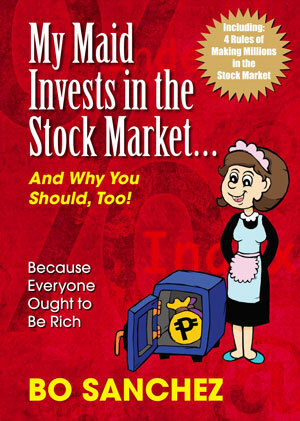 Yes, Bo’s original maid invests in the stock market and last I heard, she had more than P600,000 in stocks. No, she is no longer a maid, and is now a bookkeeper. Is this about the benefits of being lazy and earning money while on vacation? Yes! TrulyRichClub teaches its members to work hard today to build passive income streams in the future. Earning passive income means you can be lazy ( occasionally ) and earn money even while enjoying your vacation with loved ones. What does Bo Sanchez say about it? Get Wowed by the Truly Rich Club! More FAQs next time, about the benefits of TrulyRichClub membership. This entry was posted in Benefits, Bo Sanchez, SAM, Stock Market, Truly Rich and tagged affiliate, Bo Sanchez, How to Earn While on Vacation, How to Turn Passion Into Profit, Larry Gamboa, My Maid Invests in the Stock Market, philosophy of money, Richard Branson, Stock Market, strategy of money, theology of money, TRC FAQ, truly rich, TrulyRichClub FAQ, vacation home on July 24, 2013 by Bobet Prudente.